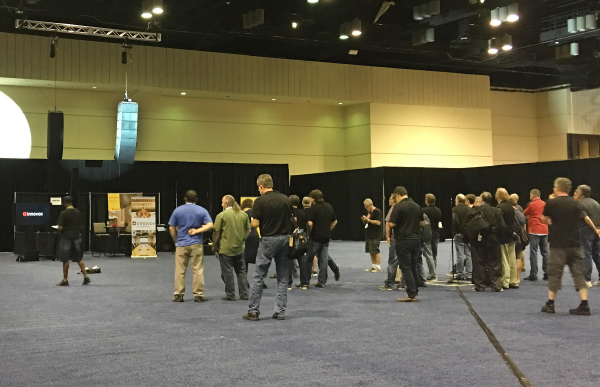 The recent Live Sound International Loudspeaker Demo at the Orange County Convention Center (Hall D2) in Orlando during the annual Worship Facilities Expo (WFX) attracted more than 400 audio professionals and church sound personnel over the course of its two-plus-day run. 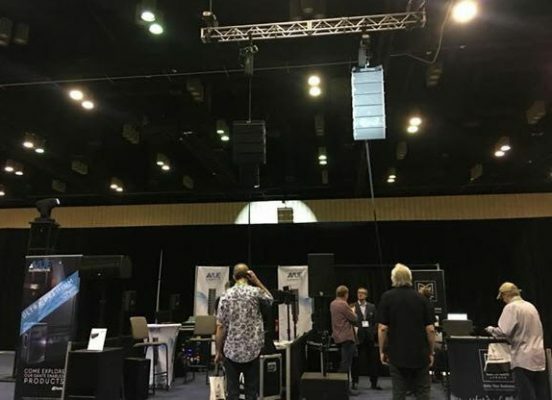 The demo, which launched eight years ago and will be running again at the upcoming 2019 NAMM show in Anaheim, delivers unique side-by-side listening opportunities to evaluate top line array and loudspeaker systems in a round-robin format. 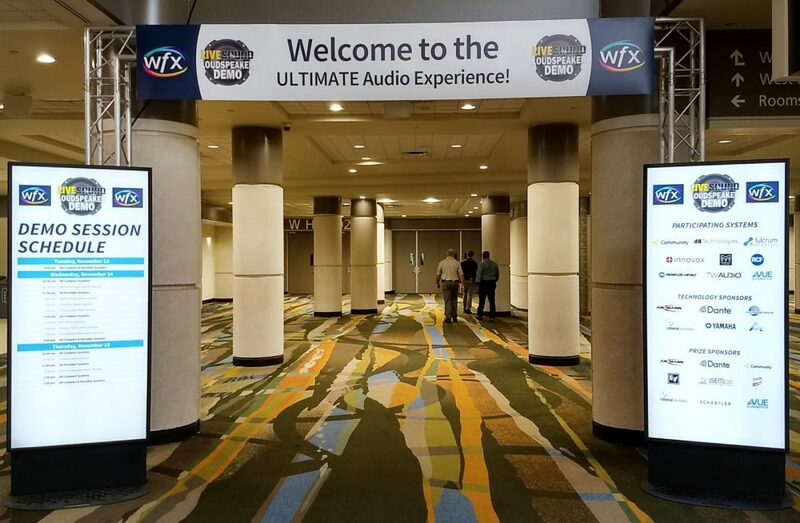 This year’s event kicked off with a highly attended evening slate of sessions for the regional pro audio community, with dedicated demo sessions focusing on portable loudspeaker systems joining the popular compact system sessions. Diversity abounded amount the compact systems, exemplified by this side of the demo area, left to right: Renkus-Heinz IC-LIVE XL, Fulcrum Acoustic FL283, and dBTechnologies VIO L208. A TW AUDiO VERA20 array being highlighted, flying next to an RCF HDL-28A array. At the front of house position in Hall D2, mix/control engineer Josh Kettler utilized a Yamaha QL5 digital console to manage and deliver audio to each system. The QL5 was joined by a Rio stage box on the opposite side of the demo space for routing individual feeds to the more remotely positioned systems. Prior to each round-robin session, all systems were fed pink noise, with the designated uniform sound pressure level set and confirmed. This process, managed by Kettler and demo host/emcee Craig Leerman, was based on portable metering incorporating an iSEMic 725TR base kit-2 analyzer from iSEMCon. 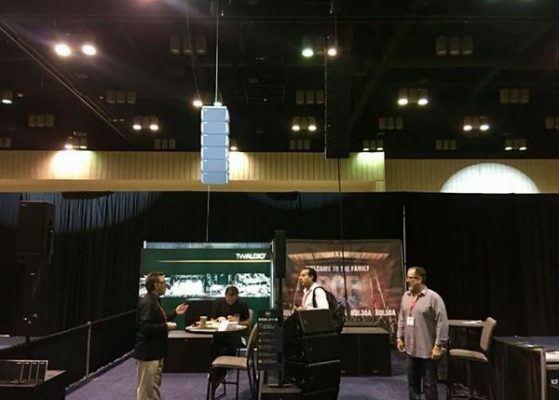 In addition, the 10EaZy measurement platform supplied by Rational Acoustics was deployed, receiving input from a centrally located measurement mic, supplied constant SPL readings to attendees via a large video monitor during all full demo sessions. For his presentations, Leerman utilized a Lectrosonics Digital Hybrid wireless transmitter feeding an R400A diversity receiver. An Ansmann ALC 161 rack-mount battery charger and rechargeable AA batteries kept the transmitter completely powered throughout the event. A professional lighting package spotlighted each individual system as it was played, while two large-format video screens in opposite corners, supplied by AE Global Media (based in Charlotte, NC), supplied attendees with key information. Both of these facets were under the expert direction of veteran production professional Bill DiPaolo, who heads up Entertainment Services in Rome, NY. The scene at the VUE Audiotechik (al-Class array, left) and Martin Audio (Wavefront Precision array, right) side of the floor. Following standard practice established at the initial demo, systems are fed identical music tracks during each compact and portable session. Listeners can evaluate what they hear and also observe each system’s scale, components and other important details, in addition to getting further technical details and pricing information from qualified representatives of each company participating in the demo. The participating manufacturers both nominated and selected (via an online voting system) the music tracks that were played. The playlist offered a diverse selection of styles, with each session featuring tracks spotlighting female and male vocals, as well as dynamic large-ensemble selections. Many of these tracks are utilized by manufacturers in their own system demonstrations in the field. Lucky attendees were awarded prizes following each demo session, including Community CS4 surface-mount loudspeakers, dBTechnologies Opera 10 powered loudspeakers, Electro-Voice ND86 vocal microphones, Ansmann rechargers w/rechargable AA batteries, a Schertler Arthur Format 48 modular mixer, VUE Audiotechnik i-6a loudspeakers, and Rational Acoustics Smaart v8 licenses and RTA420 measurement mics. Further prizes included the Ansmann recharger with rechargable batteries, a Schertler Arthur Format 48 modular mixer, Link USA Eurocable microphone cables, iSEMcon measurement mics, and Audinate Dante VIO adapters. 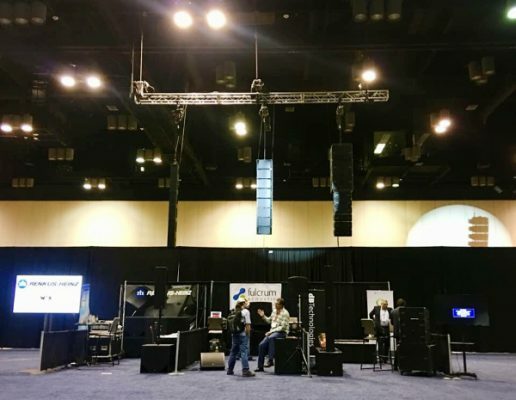 The next event is slated for the Loudspeaker Showcase in the Arena at the upcoming 2019 NAMM Show in Anaheim on January 23 to 26, followed by another demo at the United States Institute for Theatre Technology (USITT) Expo in Louisville in March. Plans are will already underway for both events, so keep an eye on ProSoundWeb for further updates in the near future. Click over to the next page to find out more about the compact systems featured at this year’s demo.